We often hear how the Moon’s appearance hasn’t changed in millions or even billions of years. While micrometeorites, cosmic rays and the solar wind slowly grind down lunar rocks, the Moon lacks erosional processes such as water, wind and lurching tectonic plates that can get the job done in a hurry. Remember Buzz Aldrin’s photo of his boot print in the lunar regolith? It was thought the impression would last up to 2 million years. Now it seems that estimate may have to be revised based on photos taken by the Lunar Reconnaissance Orbiter (LRO) that reveal that impacts are transforming the surface much faster than previously thought. The LRO’s high resolution camera, which can resolve features down to about 3 feet (1-meter) across, has been peering down at the Moon from orbit since 2009. Taking before and after images, called temporal pairs, scientists have identified 222 impact craters that formed over the past 7 years. The new craters range from 10 feet up to 141 feet (3-43 meters) in diameter. By analyzing the number of new craters and their size, and the time between each temporal pair, a team of scientists from Arizona State University and Cornell estimated the current cratering rate on the Moon. The result, published in Nature this week, was unexpected: 33% more new craters with diameters of at least 30 feet (10 meters) were found than anticipated by previous cratering models. Similar to the crater that appeared on March 17, 2013 (above), the team also found that new impacts are surrounded by light and dark reflectance patterns related to material ejected during crater formation. Many of the larger impact craters show up to four distinct bright or dark reflectance zones. Nearest to the impact site, there are usually zone of both high and low reflectance. These two zones likely formed as a layer of material that was ejected from the crater during the impact shot outward to about 2½ crater diameters from the rim. From analyzing multiple impact sites, far flung ejecta patterns wrap around small obstacles like hills and crater rims, indicating the material was traveling nearly parallel to the ground. This kind of path is only possible if the material was ejected at very high speed around 10 miles per second or 36,000 miles per hour! The jet contains vaporized and molten rock that disturb the upper layer of lunar regolith, modifying its reflectance properties. How LRO creates temporal pairs and scientists use them to discover changes on the moon’s surface. In addition to discovering impact craters and their fascinating ejecta patterns, the scientists also observed a large number of small surface changes they call ‘splotches’ most likely caused by small, secondary impacts. Dense clusters of these splotches are found around new impact sites suggesting they may be secondary surface changes caused by material thrown out from a nearby primary impact. From 14,000 temporal pairs, the group identified over 47,000 splotches so far. Based on estimates of size, depth and frequency of formation, the group estimated that the relentless churning caused by meteoroid impacts will turn over 99% of the lunar surface after about 81,000 years. Keep in mind, we’re talking about the upper regolith, not whole craters and mountain ranges. That’s more than 100 times faster than previous models that only took micrometeorites into account. Instead of millions of years for those astronaut boot prints and rover tracks to disappear, it now appears that they’ll be wiped clean in just tens of thousands! Nearly 47 years ago, the crew of Apollo 8 took an image of planet Earth from the Moon that has been called “the most influential environmental photograph ever taken.” Called Earthrise, the picture represented the first time human eyes saw their homeworld come into view around another planetary body. Now, the Lunar Reconnaissance Orbiter (LRO) has captured stunning new high-definition views of Earth and the Moon from the spacecraft’s vantage point in lunar orbit. Sometimes, it seems to be a cosmic misfortune that we only get to view the universe from a singular vantage point. Take the example of our single natural satellite. As the Moon waxes and wanes through its cycle of phases, we see the familiar face of the lunar nearside. This holds true from the day we’re born until the day we die. The Romans and Paleolithic man saw that same face, and until less than a century ago, it was anyone’s guess as to just what was on the other side. You can see the Moon going through the synodic 29.5 day period a familiar phases, albeit with an unfamiliar face. Note that the Sun zips by, as the lunar farside wanes towards New. And in the background, the Earth can be seen, presenting an identical phase and tracing out a lazy figure eight as it appears and disappears behind the lunar limb. The lunar nearside: A familiar view. Credit: Stephen Rahn. What’s with the lunar-planetary game of peek-a-boo? Well, the point of view for the video assumes that your looking at down at the lunar farside from a stationary point above the Moon. Note that the disk of the Moon stays fixed in place. The Moon actually ‘rocks’ or nods back and forth and side-to-side in motions referred to as libration and nutation, and you’re seeing these expressed via the motion of the Earth in the video. This assures that we actually get a peek over the lunar limb and see a foreshadowed extra bit of the lunar farside, with grand 59% of the lunar surface visible from the Earth. Such is the wacky motion of our Moon, which gave early astronomers an excellent crash course in celestial mechanics 101. Myth #1: The moon doesn’t rotate. Yes, it’s tidally locked from our perspective, meaning that it keeps one face turned Earthward. But it does turn on its axis in lockstep as it does so once every 27.3 days, known as a sidereal month. Myth #2: The Farside vs. the Darkside. (Cue Pink Floyd) We do in fact see the dark or nighttime side of the Moon just as much as the daytime side. Despite popular culture, the farside is only synonymous with the darkside of the Moon during Full phase. Humanity got its first glimpse of the lunar farside in 1959, when the Soviet Union’s Luna 3 spacecraft looked back as it flew past the Moon and beamed us the first blurry image. The Russians got there first, which is why the lunar farside now possesses names for features such as the “Mare Moscoviense”. Our evolving view of the lunar farside over 60 years… Credit: NASA/LRO. Think we’ve explored the Moon? Thus far, no mission – crewed or otherwise – has landed on the lunar farside. The Apollo missions were restricted to nearside landing sites at low latitudes with direct line of sight communication with the Earth. The same goes for the lunar poles: the Moon is still a place begging for further exploration. China’s Chang’e 5 T1 pathfinder mission looks back at the Earth and the lunar farside. Credit: Xinhua/SASTIND. Why go to the lunar farside? Well, it would be a great place to do some radio astronomy, as you have the bulk of the Moon behind you to shield your sensitive searches from the now radio noisy Earth. Sure, the dilemmas of living on the lunar farside might forever outweigh the benefits, and abrasive lunar dust will definitely be a challenge to lunar living… perhaps an orbiting radio astronomy observatory in a Lissajous orbit at the L2 point would be a better bet? An artist’s conception of LRO in lunar orbit. Credit: NASA/LRO. And exploration of the Moon continues. Earlier this week, the LRO team released a finding suggesting that surface hydrogen may be more abundant on the poleward facing slopes of craters that litter the lunar south pole region. Locating caches of lunar ice in permanently shadowed craters will be key to a ‘living off of the land’ approach for future lunar colonists… and then there’s the idea to harvest helium-3 for nuclear fusion (remember the movie Moon?) that’s still science fiction… for now. Perhaps the Moonbase Alpha of Space: 1999 never came to pass… but there’s always 2029! Ever wonder what your refrigerator’s impacting at the speed of a tank artillery shell would do to the Moon? The Lunar Reconnaissance Orbiter’s (LRO) primary camera has provided an image of just such an event when it located the impact site of another NASA spacecraft, the Lunar Atmosphere and Dust Environment Explorer (LADEE). The fridge-sized LADEE spacecraft completed its final Lunar orbit on April 18, 2014, and then crashed into the far side of the Moon. LADEE ground controllers were pretty certain where it crashed but no orbiter had found it until now. With billions of craters across the lunar surface, finding a fresh crater is a daunting task, but a new method of searching for fresh craters is what found LADEE. The primary purpose of the LADEE mission was to search for lunar dust in the exceedingly thin atmosphere of the Moon. NASA Apollo astronauts had taken notes and drawings of incredible spires and rays of apparent dust above the horizon of the Moon as they were in orbit. To this day it remains a mystery although LADEE researchers are still working their data to find out more. The LRO spacecraft has been in lunar orbit since 2007. With the LROC Narrow Angle Camera, LRO has the ability to resolve objects less than 2 feet across, and it was likely just a matter of finding time to snap and to search photos for a tiny impact crater. However, the LROC team recently developed a new algorithm in software to search for fresh craters. Having a good idea where to begin the search, they decided to search for LADEE and quickly found it. The LROC team said the impact site is “about half a mile (780 meters) from the Sundman V crater rim with an altitude of about 8,497 feet (2,590 meters) and was only about two tenths of a mile (300 meters) north of the location mission controllers predicted based on tracking data.” Sundman Crater is about 200 km (125 miles) from a larger crater named Einstein. The LADEE impact site is within 300 meters of the location estimated by the LADEE team. The ground control team at Ames Research Center knew the location very well within just hours after the time of the planned impact. They had to know LADEE’s location in orbit with split-second accuracy and also know very accurately the altitude of the terrain LADEE was skimming over. LADEE was traveling at 1699 meters per second (3,800 mph, 5,574 feet/sec) upon impact. But still, finding something as small as this crater can be difficult. Looking at these images, the scale of lunar morphology is very deceiving. Craters that are 10 meters in diameter can be mistaken for 100 meter or even 1000 meters. The first image and third images (below) in this article are showing only a small portion of the external slope of the eastern rim of Sundman V, the satellite crater to the southeast of crater Sundman. Sundman V is 19,000 meters in diameter (19 km, 11.8 miles) whereas the first image is only 223 meters across. The following image, which is the ratioing of “before” and “after” impact images by LROC, clearly reveals the impact scar from LADEE. LADEE’s crater is only approximately 10 feet in diameter (3 m) with the ejecta fanning out 200 meters to the west by northwest. LADEE was traveling westward across the face of the Moon that we see from Earth, reached the western limb and finally encountered Sundman. In the third image of this article (above), only a 1000 meter square view of the outer slope of Sundman V’s eastern rim is seen. Rather than take the difference between the two images, which is essentially what your eye-brain does with an image pair, LROC engineers take the ratio which effectively raises the contrast dramatically. Sundman V crater is on the far side of the Moon but very near the limb. At times, due to lunar libration, this site can be seen from the Earth. In the Lunar Orbiter image, below, Sundman and satellites J & V are marked. The red circle in the image below is the area in which LROC’s high resolution images reside. Furthermore, the famous Arizona meteor crater east of Flagstaff would also easily fit inside the circle. The discovery so close to the predicted impact site confirmed how accurately the LADEE team could model the chaotic orbits around the Moon – at least during short intervals of time. Gravitationally, the Moon is truly like Swiss cheese. The effects of upwelling magma during its creation, the effects of the Earth’s tidal forces, and all the billions of asteroid impacts created a very chaotic gravitational field. Where the lunar surface is higher or more dense, gravity is stronger and vice-versa. LADEE struggled to maintain an orbit that would not run into the Moon. Without a constant vigil by Ames engineers, LADEE’s orbit would be shifted and rotated relative to the Moon’s surface until it eventually would intersect the Lunar surface – run into the Moon. Eventually, this had to happen as LADEE ran out of propulsion fuel. The method used by the LROC team in its basic approach is by no means new. Clyde Tombaugh used a blink comparator to search for Planet X for several months and many frame pairs of the night sky. The comparator would essentially show one image and then a second of the same view taken a few nights apart to Clyde’s eye. Tombaugh’s eye and brain could process the two images and identify slight shifts of an object from one frame to the other. Stars are essentially fixed, don’t move but objects in our solar system do move in the night sky over hours or days. In the same way, the new software employed by LROC engineers takes two images and compares them mathematically. A human is replaced by a computer and software to weed out the slightest changes between a pair of images; images of the same area but spaced in time. Finding changes on the surface of a body such as the Moon or Mars is made especially difficult because of the slightest changes in lighting and location of the observer (the spacecraft). 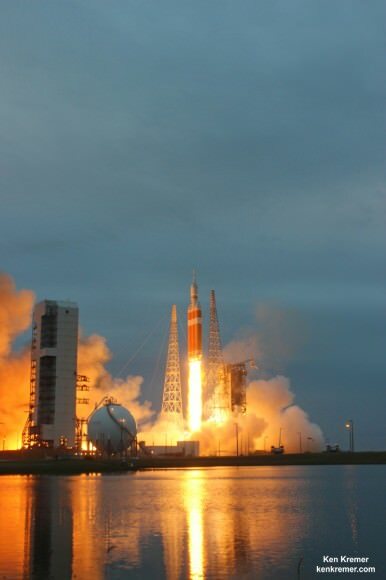 The new LROC software marks a new step forward in sophistication and thus has returned LADEE back to us. The following Lunar Orbiter image from the 1960s is high contrast and reveals surface relief in much more detail. Einstein crater is clearly seen, as is Sundman with J and V satellite craters on its rim. Wow, this doesn’t happen very often: Earth and Mars together in one photo. To make the image even more unique, it was taken from lunar orbit by the Lunar Reconnaissance Orbiter. This two-for-one photo was was acquired in a single shot on May 24, 2014, by the Narrow Angle Camera (NAC) on LRO as the spacecraft was turned to face the Earth, instead of its usual view of looking down at the Moon. The LRO imaging team said seeing the planets together in one image makes the two worlds seem not so far apart, and that the Moon still might have a role to play in future exploration. The LROC team said this imaging sequence required a significant amount of planning, and that prior to the “conjunction” event, they took practice images of Mars to refine the timing and camera settings. When the spacecraft captured this image, Earth was about 376,687 kilometers (234,062 miles) away from LRO and Mars was 112.5 million kilometers away. So, Mars was about 300 times farther from the Moon than the Earth. The NAC is actually two cameras, and each NAC image is built from rows of pixels acquired one after another, and then the left and right images are stitched together to make a complete NAC pair. “If the spacecraft was not moving, the rows of pixels would image the same area over and over; it is the spacecraft motion, combined with fine-tuning of the camera exposure time, that enables the final image, such as this Earth-Mars view,” the LRO team explained. Check out more about this image on the LRO website, which includes a zoomable, interactive version of the photo. If you’re a fan of moon observation, it’s lucky for you that spacecraft such as the Lunar Reconnaissance Orbiter exist. For about the past five years, the NASA spacecraft has been in orbit around a closest large neighbor, taking images of the surface in high-definition. To celebrate LRO’s fifth anniversary, NASA is asking members of the public to vote on which of those images (above) is their favorite. This isn’t so much a statement about the scientific data it has collected, NASA said, but more appreciating the images as art. Voting runs from May 23 to June 6, and the winner will be announced with the full collection’s release on June 18 — the actual official fifth anniversary of the launch. You can find more information about the vote at this page. By the way, LRO not only takes good pictures of the moon, but also of other spacecraft. You can check out its pictures of LADEE and Chang’e-3 in these past Universe Today articles. Meanwhile, James Garvin — NASA’s chief scientist of the sciences and exploration directorate — eloquently weighs in below on his favorite images of the moon. His description of Aristarchus is interesting: “Here is Mother Nature’s expression of a gigantic landform made by a cosmic collision.” You can check out the other four below.